OfferCraft is easy to set up and use from one campaign to another. More importantly, it has been nimble enough to meet both our creative and analytical needs across many targeted channels. 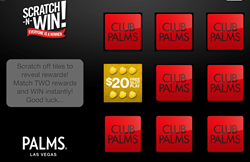 OfferCraft, a Las Vegas-based software company, signed a deal with the world-famous Palms Casino Resort that will give guests new ways to earn rewards, such as a video basketball game to win free drinks, or scratch-to-win games in emails to unlock bonus points from Club Palms. Some of the games will be available in the property, while others will be accessible via the palms.com website and other channels. Unlike traditional prizes, the rewards earned from playing these games are more interactive — as an example, if a guest wins a reward that he or she doesn’t like, the software allows the guest to swap it out for something else. OfferCraft blends gamification tools with deep insights into human psychology to deliver more engaging incentives that delight and entertain customers. For more information on OfferCraft or to request a demo, please visit OfferCraft.com. OfferCraft is a Software-as-a-Service company that helps organizations craft better offers. Inspired by game theory and customer psychology, OfferCraft’s unique gamification software transforms traditional incentives into far more effective offers and rewards — ultimately motivating many more people to use them. The platform weaves together tools ranging from customizable games to next-generation sensors to sophisticated learning algorithms. Clients use it to invigorate marketing campaigns, employee education efforts, surveys, coupons and more, often doubling or tripling their participation rates. OfferCraft serves enterprise customers across multiple industries including retail, hospitality, healthcare, transportation, entertainment, and energy. For more information or to request a demo, visit http://www.OfferCraft.com.